Flying Focus' 25 Year Anniversary! In 2016 Flying Focus Video Collective turns 25 years old! • Our founding members got together during the "Gulf War" in January, 1991. • In August of 1991, we formally incorporated as Flying Focus. • November 18, 2016 marks exactly 25 years since our weekly half-hour showcase, the Flying Focus Video Bus premiered. Celebrate by watching all 25 of our anniversary retrospective shows August 8-Nov 25! NEW! 12/16 Retrospective Shows Streaming! Playback schedule of our anniversary marathon! To celebrate our 25th anniversary, Flying Focus has begun posting all 25 of its anniversary shows online! or on our YouTube clips page. Portland Community Media Recognizes Flying Focus! In its August 2016 newsletter, Portland Community Media featured an "interview" with Flying Focus about our milestone anniversary. PCM has been our home for our entire existence, we couldn't have done this without them! The Willamette Week remembered the protest against President George H.W. Bush which took place in Sept. 1991 and which Flying Focus covered live on the air. (WW was predicting a large protest about Donald Trump in May 7, but he never finalized plans for a Portland area rally.) The article recounts the history of Portland being dubbed "Little Beirut." The last section is about the GHWBush protest we covered live on cable access and our struggle to keep the police from using our footage to target people for arrest. 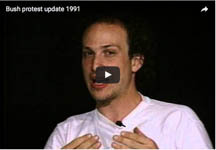 At the end of the link you can see an excerpt from our October 1991 show in which FFVC member Dan Handelman gives an update on a man who was arrested for inciting a riot, with that charge downgraded to standing on TriMet property without boarding a train. The clip is from our second show, but the first after forming as Flying Focus, known as "Che's Lounge/'P' is for Perception." 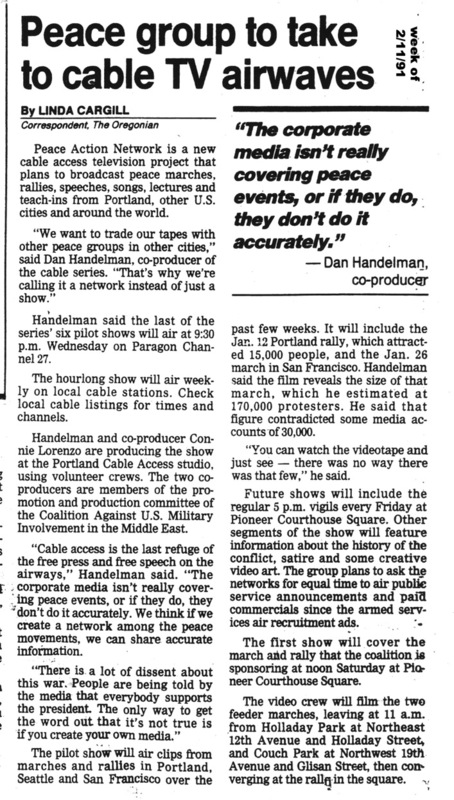 We've also posted an article that ran in October, 1991 in Willamette Week describing the struggle to keep our tapes from being used to track down protestors. Check out this article from the Oregonian about our first program, "Peace Action Network." The show started in March 1991 as a project of the Promotion and Production Committee of the Coalition Against US Military Intervention in the Middle East (CAUSMIME), the group that eventually became Flying Focus. Celebrate 25 Years of Flying Focus 1991-2016 by Watching All 25 of our Anniversary Shows! Starting August 8, Portland Comcast and CenturyLink subscribers will be able to see all 24 past "Busiversaries" over a 14 week period. (A full schedule is listed in the table at the bottom of the page). For more information, or particularly if you want to get involved by volunteering for or donating anything for the Twenty-Fifth Anniversary (videotapes, DVD-RAMs, or other items from the wish list) please get in touch with us at 503-239-7456 or ffvc@flyingfocus.org. Twenty-Fifth Busiversary (2015-16) Part 1--Week of November 14 on the Video Bus - Premiere! Twenty-Fifth Busiversary (2015-16) Part 2--Week of November 21 on the Video Bus - Premiere!